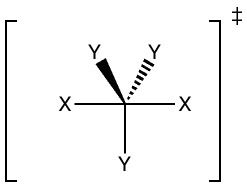 This transition state is normally regarded as the only situation in which carbon can sustain penta-coordination (there are some exceptions), and this is often contrasted with the analogous situation for silicon, which demonstrates an abundance of stable penta- (and hexa-)coordinate (crystal) structures. Perhaps inevitably therefore, chemists have set themselves the goal of capturing a penta-coordinate carbon, not as a transition state with fleeting lifetime, but as a stable (and perchance crystalline) species. The best strategy is to explore potential systems computationally, and the latest report of such an exploration has some suggestions for synthesis (Pierrefixe, S. C. A. H.; van Stralen, S. J. M.; van Strale, J. N. P.; Guerra, C. F.; Bickelhaupt, F. M., “Hypervalent Carbon Atom: “Freezing” the SN2 Transition State,” DOI: 10.1002/anie.200902125). Their suggestion corresponds to Y=CN and X=At (Astatine), a rather esoteric combination it has to be said. In the manner of the blogosphere, Steve Bachrach has noted this report in his own blog, where a discussion has opened up on the origins of why carbon can be regarded as abnormal (at least compared to silicon), and more particularly whether such a species should be regarded as merely hypercoordinate, or as Bickelhaupt and co-workers suggest, hypervalent. In fact, such reports are not new. 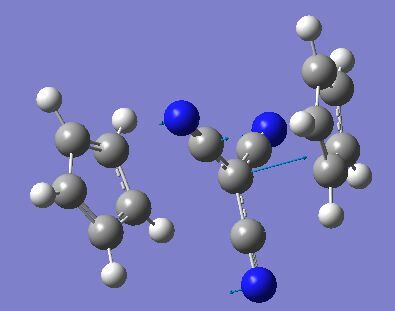 As I note in the discussion of Steve’s blog, a crystalline structure of a hexa-coordinate carbon compound was reported in 2008 (DOI: 10.1021/ja710423d (below), and it is also tentatively described as possibly hexavalent near the end of the article! I shall return to this compound in the second part of this post. The astatine system reported above is unusual, and it really only contains three carbon-carbon bonds surrounding the pentacoordinate carbon. 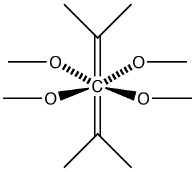 The compound above contains only two such C-C “bonds”. It would be perhaps more interesting to ask if one could design a compound with five C-C bonds surrounding the putative pentacoordinate atom. Whilst mulling over Steve’s post, and pondering my contribution to that blog, a colleague in my department wandered into my office (my door is almost always open) and without saying a word, he wrote a structure on my blackboard (yes, I really do have such). He then walked out (almost; I believe he did mutter perhaps two words before leaving). He had sketched the key feature of an article by Ethan L. Fisher and Tristan H. Lambert entitled Leaving Group Potential of a Substituted Cyclopentadienyl Anion Toward Oxidative Addition (DOI: 10.1021/ol901598n). This triggered the following question in my mind: could the aromatic cyclopentadienyl anion act as the X group in the pentacoordinate carbon example above? The essential property of group X is that it must be big! Well, cyclopentadienyl can be made big! It would also achieve the purpose of forming a penta-coordinate carbon with five C…C bonds. So in it goes for a B3LYP/6-311+G(2df) calculation. Surely, the life of a computational chemist is an easy one; all one has to do is wait a few hours (or, with a large basis set, days) for an answer. The result is shown below. The key vibrational mode (which you can see animated if you click on the image above) has a wavenumber of 194 cm-1 (B3LYP/6-311+G(2df); other basis sets show similar values). It corresponds to the SN2 mode, and is what we normally think of as the transition or reaction normal mode for this reaction. But in this case, it is not an imaginary mode, but a real mode! The SN2 has been (virtually) captured for a penta-coordinate carbon with five C…C interactions. How does it compare with the astatine system noted in 10.1002/anie.200902125? Well, unfortunately, the umbrella-mode for that system is only reported as a force constant without mass weighting, so it cannot be compared to the mass-weighted value we have here. The calculation is digitally archived (e.g. as 10042/to-2407 or 10042/to-2415) so you can analyze it for yourself! An obvious question to ask is what the nature of the axial bonds for X=cyclopentadienyl is. Is the central carbon hypercoordinate, or hypervalent, or both? But this blog is quite long enough already, and so this will all be discussed in part 2, to follow shortly. Oh, one final comment. The issue of hypervalency and hypercoordination of carbon has previously been discussed largely in conventional scientific publications (for which DOIs are provided above). The forum moved to Salt Lake City in the USA, where some of the results were presented orally at the ACS spring conference in 2009. Now that it has been formally published, it has been taken up by Bachrach in his blog, where some of the discussion has continued. So where should I have presented the present result? In the primary scientific literature? Or perhaps another ACS meeting? Well, here it is in another blog (I have been variously told I am either brave or very foolish for doing so!). And as I write this, of course it is not peer reviewed (but there is nothing to stop people from commenting on this of course, as has happened in Bachrach’s blog). Will it “count” here – in other words, does it (yet) have any scientific respectability? Should blogs report new scientific results, or merely be reserved for commenting on such results which have been reported in the “proper scientific manner”? Will indeed this result appear in the future in the scientific literature under different authorship, but with no accreditation for this blog? If I do choose to “write it up properly” (assuming the journals now let me), can I cite this blog in the way one can cite the ACS conferences? I do not suppose many people know what the answers are to all these questions. Perhaps the appearance of this post might provide some? This entry was posted on Tuesday, September 22nd, 2009 at 4:23 pm and is filed under Hypervalency, Interesting chemistry. You can follow any responses to this entry through the RSS 2.0 feed. You can leave a response, or trackback from your own site.